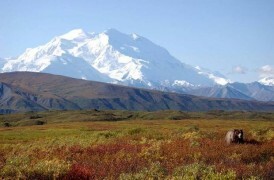 Words like magnificent, stunning, and awesome fall short when describing Denali National Park. Except to say―a visit to nature’s masterpiece, sculpted by wind, water and glaciers offers an exciting remote wilderness experience, where bears, moose, caribou and Dall sheep make their home. There’s no other way to say this: Alaska is huge! With few major highways or roads, you may ask: How do I get to Denali National Park from Anchorage or Fairbanks? With a wide variety of ways to reach Denali, we began our Alaska adventure on Alaska Airlines, which we boarded at OC’s John Wayne Airport, then jetted to Seattle and flew straight into Fairbanks. The next day we climbed aboard a shuttle bus for a two-hour ride to the entrance of Denali National Park. Other ways for easy access Denali National Park are on the Alaska Railroad, which leaves daily from Anchorage and Fairbanks during the summer months, or choose to fly into the park from either Anchorage or Fairbanks on Kantishna Air Taxi or another charter service. Shuttle bus and car rental options are also available in these cities. There is only one road that penetrates Denali’s expansive wilderness: the 92-mile Denali Park Road, which begins at the park’s entrance and winds its way to Kantishna, which is located at the end of the road. The first 15 miles of the road is paved and open to all vehicles, but beyond the Savage River checkpoint, access is limited to the park’s shuttles and tour buses. The 12-hour, roundtrip Kantishna Bus Excursion allows you to fully witness the grandeur of the park. This extended tour also provides more opportunities to view a variety of wildlife living in their natural habitat. Lunch, snacks and beverages are included on this trip. If time is limited or the bus ride seems too long, you can fly directly into Kantishna on Kantishna Air Taxi, which offers daily flights on a single-engine Cessna 206 from Anchorage and Fairbanks, or board an air taxi at the park’s entrance. The Kantishna Air Taxi is the only air passenger service that is allowed to land and take off from Kantishna’s airstrip. While traveling on a one-way bus tour to Kantishna, our interpretive guide/driver knew the best places to view wildlife. He pointed out moose near clear, blue lakes, and we were awestruck by Dall sheep standing on steep, barren ridges. Around every turn in the road, we intensely watched for grizzly’s and wolves that make their home in Denali, along with herds of caribou which roam throughout the park. One of the park’s major attractions is North America’s tallest mountain, Denali, which the native Athabascans call “The High One.” Yes, Denali (Mt. McKinley) dominates the park at more than 20,300 feet tall. Most of the time, however, the mountain’s super tall snowy peak is shrouded in clouds (an average of two out of three days in the summer). On the Kantishna bus tour, you can increase your odds of a glimpse at Denali. Your chances of a Denali sighting increase dramatically when you stay for two or three nights at the Kantishna Roadhouse, which is located close to Wonder Lake (a prime-time Denali viewing and picture-taking site). Guests at the Kantishna Roadhouse enjoy quiet nights spent in comfortable cabin accommodations with private bathrooms and climate controls. The ambiance of our charming log cabin with its rustic handcrafted furniture and two queen beds covered with warm quilts made us feel like we were living in the back country. But don’t expect TV’s or Internet access here. The roadhouse’s lodge and its cabins are meant to give guests the experience of nature’s serene environment. Of course, there are many opportunities to enjoy outdoor activities around Kantishna such as hiking, mountain biking, guided hiking tours and gold panning or fly fishing in Moose Creek. All of these activities are included in the stay as well as meals and snacks. The roadhouse’s lodge serves complete breakfasts, lunches and dinners. For guests going on day hikes, the kitchen prepares nutritious sack lunches for the trail. The lodge’s full-service saloon serves a selection of fine wines, Alaskan beers and traditional spirits. We sipped cocktails in the saloon and then adjourned to the dining room for a dinner of perfectly-grilled Alaska salmon with a citrus glaze and freshly steamed broccoli. Yum! The next morning after a hearty breakfast, a park ranger joined us for a guided tour and hike at the picturesque Wonder Lake, which is located 35 miles from the base of Denali. Unfortunately, the cloud cover didn’t allow us even a peak of the massive mountain, and we returned to the lodge’s great room for sipping hot cocoa around a cast-iron stove. By afternoon, our flight on Kantishna Air Taxi was ready for take off, and we soared above the Alaskan Range in a single-engine plane for an awesome flightseeing experience. The plane passed over glaciers, rivers and lakes, and when it crossed jagged peaks, we saw Dall sheep precariously standing on ribbons of granite. The pilot skillfully dipped down into valleys, covered in fall colors of reds and oranges, and we were mesmerized by stunning vistas as we traveled high above Denali’s wildlands. The one-way Kantishna bus tour, combined with the flightseeing experience, gave us the best of both worlds: a ground level view of the landscape and animals and the expansive vista of the park’s wildlands from the air. However, our sightseeing tour of Denali wasn’t over yet. We rode the Alaska Railroad out of the park and back to Fairbanks, and along the way, we enjoyed more breathtaking views from comfortable seats in a double-decker luxury dome car and in the dining car. Ready for scenic and wildlife sensory overload? Denali promises to deliver awe-inspiring and heart-stopping wilderness thrills while traveling through or across the unparalleled beauty of dynamic Denali National Park. Joanne Tucker is a lifestyles writer based in Costa Mesa, Calif.